Last few stop at Kyoto would be Ginkakuji, Yasaka Shrine and finally Gion. 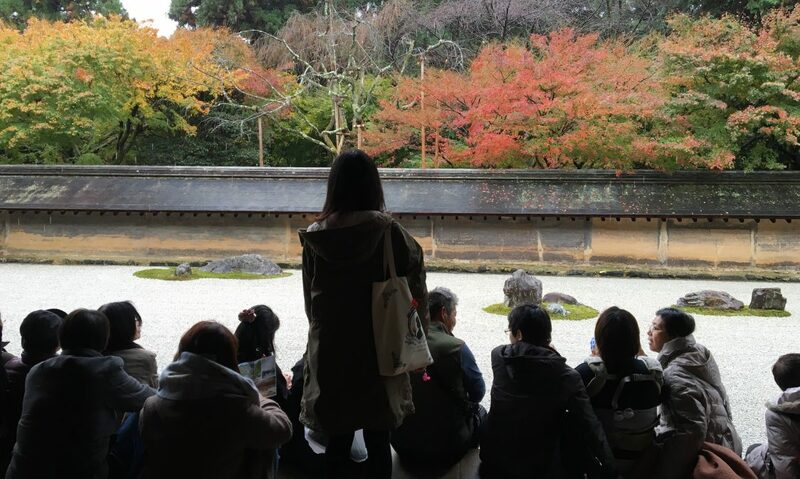 Ginkakuji is another zen temple in Kyoto that I almost drop out from my itinerary. I thought it was inaccessible by train and a long walk from the bus stop. However, I was thankful that I came. By taking a walk through the philosopher path especially during Spring, you will find yourself in for a treat. The view was magnificent during Spring 2016 from those pictures I saw online. Ginkakuji has over 600 years of history. It started in 1482 where Shogun Ashikaga Yoshimasa built this villa for his retirement purposes. The villa was converted into a zen temple after his passing. It was a very relaxing stroll through the garden as it was really cooling and beautiful. Been walking alot in this trip so walking up for a view was a must! After that, made my way out of the villa and head straight to a cream puff stall. The sales girl was really cute, so I decided to get one. hahaha. Next, I took a bus not far away from here and I got a text from my colleague to buy sake for him. Lol. In the end, I did not look it up as I was not sure about my budget. I took the bus back to Gion. I was already at Gion when I took the bus to Ginkakuji. I even told my ramen friend that I had to give the recommended place a miss as it was an hour trip from where I was. By the time I reached Gion, it was already late evening. The sky would turn dark in about an hour so I decided to visit the last shrine in Kyoto. Founded over 1350 years ago. This shrine is famous during summer for its Gion festival celebrated every July. TAKE NOTE! As it gets darker, the lanterns would lit up. They do have the fortune telling boxes but I was in a low mood that day. My friend was being cold to me through texts so it kind of got into me. I thought probably when you want to ask for a fortune, you should stay happy? I dont know. After that, I walked back to Gion. On the way, I saw this crab stick stall. Really huge but I did not try it. I suspect there would not be much meat on it and mostly should be etc items. Lol. But do give it a try and let me know if you saw it. The stall is just at the entrance of the short walk up to the shrine. At Gion, it was said to be a really exquisite district by my friend. Things here are expensive etc. I did not went on to do much of a shopping but got some snacks from a chiffon cake shop. From what I felt, Gion is very much at medium tier. Not as expensive as Ginza of Tokyo. That’s my opinion might be wrong.